Updated Jan. 25, 2019, at 5 p.m. EST: The votes have been tallied and a winner has been announced. Congratulations to Jenna Anderson of Finess! 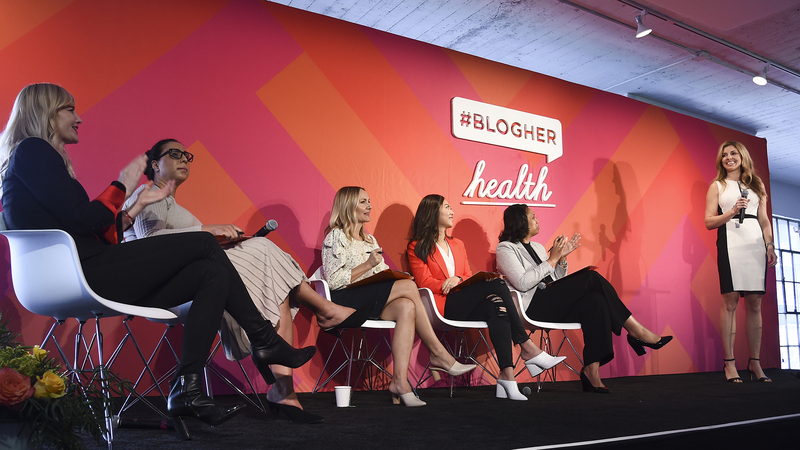 Original story, published Jan. 25, 2019, at 2:14 p.m. EST: Courtney Nichols Gould, a cofounder and CEO of SmartyPants Vitamins, welcomed three female entrepreneurs to SHE Media’s BlogHer Health 2019 stage in Los Angeles on Friday, Jan. 25, for a program called The Pitch. The Pitch — which was sponsored by FedEx and introduced onstage by Jen Denton, senior vice president of programming for SHE Media — is similar to the hit TV show Shark Tank and spotlights up-and-coming female visionaries, giving them the chance to explain their companies to a panel of business-savvy judges. After a hardball Q&A session, the audience votes for their favorite pitcher via Twitter, and the winner receives a $50,000 marketing-and-media package from SHE Media. This year, the panel of judges was made up of five women with an overwhelming amount of entrepreneurial business wisdom: Camille D. Washington of FedEx, Courtney Nichols Gould of SmartyPants Vitamins, Dr. Renee Dua of Heal, Sadie Lincoln of Barre3 and Sarah Lee of Glow Recipe. Ella Mihov was the first contestant to take the stage to pitch her business Lune, a modern, personalized-nutrition company she founded when she was feeling physically ill but couldn’t figure out why. She sought help from a specialty doctor, who ran a number of diagnostic tests on her and discovered she had several nutritional deficiencies. Armed with that information, she changed the way she ate and immediately noticed an improvement — and was inspired to empower others to improve their well-being through their diet. Lune’s program begins with an at-home urine test kit that you mail in to be analyzed by a team of nutrition specialists. In addition to receiving a report on the findings from your sample along with suggestions for areas of improvement in your diet, you’ll have an online meeting with a doctor to talk about your symptoms and get supplements that are customized to exactly what your body needs. Next to the stage was Ana Pompa Alarcón Rawls, founder and CEO of findSisterhood — an app for everyone who identifies as a woman to share their stories and ask their questions anonymously. Rawls founded the company after she had her first child and was feeling alone and isolated. She felt like she couldn’t talk about the postpartum depression she was experiencing and longed for a way to talk about what she was going through without revealing her identity. The app provides women with a safe place to discuss anything from sexual assault to deportation to infertility and lets women everywhere know they’re not alone — no matter what they’re going through. The third and final pitcher, Jenna Anderson, is the cofounder of Soft Health Technologies, a company committed to making feminine and sexual health fun and easy at every age. She’s also the creator of Finess — a new over-the-counter disposable patch that stops bladder leaks before they start. The single-use device is soft and worn externally over the urethral opening to create a leak-proof seal that’s totally comfortable. The judges and the pitchers aren’t the only ones who get to participate in The Pitch program. You can cast your vote for your favorite pitch contestant by tweeting #PitchElla, #PitchAna or #PitchJenna along with the hashtag #BlogHerHealth19. The winner will be announced in the afternoon on Friday, Jan. 25 at the BlogHer Health 2019 conference in Los Angeles.